Survival & rescue operations demand a versatile knife able to withstand the most extreme conditions. Simply put, the Cold Steel SRK (survival rescue knife) was designed specifically with this in mind. A popular knife with military and tactical law enforcement personnel, the SRK is the standard Issue knife of the navy seals for their buds - or basic underwater Demolition training - the SRK has proved its Worth time and time again in the most demanding environments. Whatever the mission, Cold Steel is confident that the SRK is the knife for you! this SRK blade is made of SK-5. Includes: - Secure-Ex sheath. Specifications: - weight: 8.2 oz. 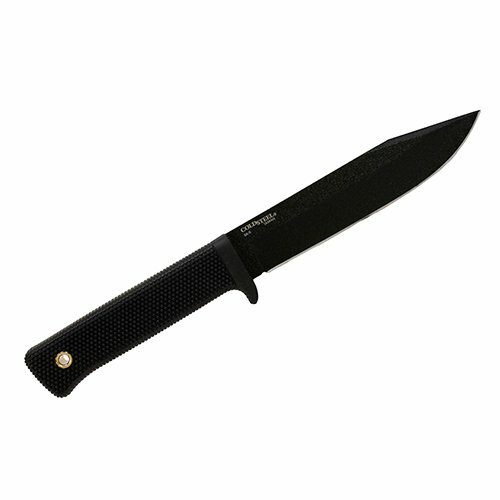 - thickness: 5mm - blade length: 6" - handle: 4 3/4" long Kray-Ex - steel/material: SK-5 with black Tuff-Ex finish - overall: 10 3/4"